This is my personal story that I wrote based on the memories of my tour of duty in the City of West Berlin, Germany. My story begins on 6 October 1979. As a young sergeant in the United States Army, I volunteered and was assigned for duty in what was then known as West Berlin, Germany. I was assigned for duty with HHC Berlin Brigade. 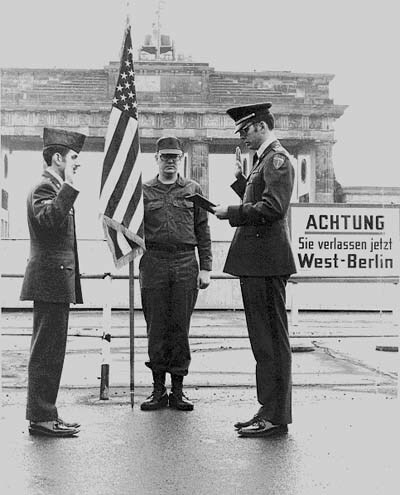 My job was to reassign incoming American personnel to military organizations within the city of West Berlin. This was a time when the city of East Berlin was still occupied and controlled by the Communistic influences of the East German and Russian governments. My journey began at the LaGuardia Airport in New York City with an eight-hour non-stop flight to Frankfurt, Germany, and a connecting flight to the Temple Hoff Airport in West Berlin, Germany. My plane landed early in the afternoon and I was escorted by U.S. military liaison personnel to what would be my new home for the next 12 months, Andrews Barracks. Andrews Barracks was home to various U.S. military organizations assigned to West Berlin. It also served as the Headquarters for Hitler's elite SS Troops during World War II and was the execution arena for enemies of the Third Reich. As we departed the airport terminal, I noticed two carloads of Russian soldiers parked next to the curb, which made me feel very uncomfortable. I would discover later that an apparent agreement had been established between the United States and Russia that allowed the Russians to drive freely in the Western sector of Berlin and that the United States could do the same in the Eastern sector of Berlin. During my first two weeks in the country, I attended what was known as soldier orientation. We were transported to class each morning by bus and, without fail, there were always two Russian cars parked across the parking lot observing our actions with intense curiosity to try to identify our motives for being there. In actuality, this was their means of keeping track of U.S. personnel assigned to Berlin and to ensure that no secret weapons were being brought into the country or that no special training was being conducted without their knowledge. As a United States soldier, I was instructed to either ignore the Russian vehicles or salute; any other greeting was strictly forbidden. Anyone found cursing or throwing objects at the Russian vehicles were immediately transfered out of the country. Such actions would create an international incident that the U.S. Government would not tolerate. Besides, the Russian vehicles were always equipped with cameras and would film each incident and report them to their command authority. As part of our orientation, we were transported through Check Point Charlie, which was a control point between East and West Berlin. At Check Point Charlie we were processed and allowed to proceed into occupied East Berlin territory for a bus-guided tour of the city. We were not allowed to take pictures of the city or of any Russian, East German soldiers, or civilians. In most American cities, many people walk about shopping or just spend the day having a good time. One might even notice the many vehicles of various makes and models lining the streets and curbs. However, that was not the case in East Berlin. Very few people and vehicles are seen during the day. I would later learn that only high-ranking officials or individuals in the Communistic party were allowed to own and operate vehicles. During our orientation tour I noticed only one gas station in the entire city. Cars were lined up for one or two blocks waiting for gas. Many of the city buildings were still scarred from the bombings of World War II. The Russian embassy was identified by the heavy bronzed-metal German swastikas still embedded on each side of the entranceway. The swastikas had been placed there during the days of the Third Reich. We were allowed to visit the Russian cemetery built on the outskirts of the city and dedicated to the Russian soldiers who were killed during the invasion of Berlin in World War II. The cemetery entrance was constructed of an archway made of beautiful red marble confiscated from Hitler's bunker that was destroyed by the Russian government. Upon entering the cemetery, one observes a statue of Mother Russia facing north over the gravesites of the Russian soldiers who were killed in World War II. The grave sites were landscaped with marble walkways and various assortments of beautiful flowers common to the area along with weeping willow trees purposely planted along the confines of the cemetery giving the visitor the impression of a mother reaching, embracing, and weeping for her lost children. We saw numerous East German factories with armed guards posted at all four corners of each facility. Later in the afternoon, we were allowed to stop and visit some of the local shops to purchase items of interests or souvenirs. Of course, our shopping locations were limited to a specified area of the city designated by the East German government. The money exchange rate during this period was seven American dollars for every East German deutchmark a good exchange rate for buying souvenirs. Unfortunately, there were limited items for purchase. This was also evident in many of the restaurants. In one particular restaurant, I remember seeing only one dinner roll and one sausage link on display. When we tried to order other food items, we were either ignored or the owner would simply say they had nothing else to serve. Probably, the saddest moment of my tour was watching West German family members climbing upon wooden scaffolding type platforms built next to the Berlin Wall to view the Eastern sector of East Berlin in hopes of seeing a family member or to yell and scream obscenities at the East German border guards as they patrolled back and forth. 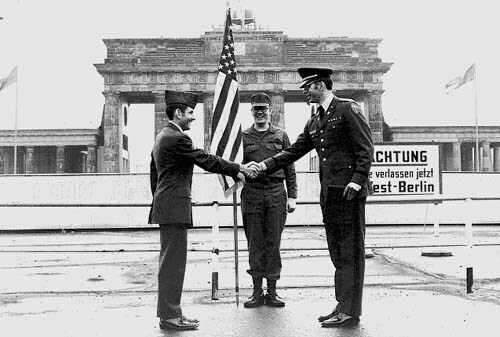 In, some cases, the East German guards would wave or attempt to entice individuals including American military personnel to cross over the wall. Of course, if any Army personnel or West German national decided to make the attempt, they would have been shot immediately. I recall, many nights lying in bed hearing gun shots being fired in the distance and finding out the following day that an East German national was killed trying to get over the wall to freedom. After all, I too was a prisoner of the Communistic regime. The Berlin Wall itself not only divided the city of Berlin but also surrounded the city. The only escape routes for military personnel were either by aircraft or by car through East Berlin. The three allied countries of the United States, Great Britian and France who were committed to guard the well-being of the German people in West Berlin, knew that the life expectancy should Russia attack, would be only twenty-minutes. The year that I spent in West Berlin made me realize just how much we as Americans have taken advantage of the freedoms we enjoy everyday. Most importantly, we have forgotten that freedom doesn't come cheap, that there's a price that must be paid. Many have paid the price with their very lives so that our families can continue to enjoy what so many in the city of East Berlin were deprived of for so many years. After, twenty years of military service, I was reminded of an old military saying that was instilled and repeated so many times that it is etched on my mind. It states "Freedom is worth fighting and dying for." Text and photographs (c) Rick B.